Though pushed by the EU Commission president, a next round of enlargement of the euro area needs to be prepared carefully. A commentary by Robert Stehrer. Most EU Central and Eastern European countries that have not yet adopted the euro only partly meet the nominal convergence criteria so far. None of the countries have yet entered the Exchange Rate Mechanism (ERM) II; thus it would take at least two years from now for these countries to adopt the euro; a potential enlargement of the euro area could therefore only take place after 2020 or 2021 at the earliest. Additionally, assessment criteria need also to include other relevant factors indicating convergence and real economy developments; achieving such goals could be helped by the proposed ‘euro accession instrument’. Accession to the euro area is not equally attractive across EU-CEE countries; the more advanced countries tend to be less in favour of joining the euro area. Enlarging the euro area needs to be backed up by further EU initiatives such as completing the banking union and the capital union; however, the EU and the euro area might now be better placed to mitigate potential risks due to institutional arrangements set up in the course of the crisis. ‘The euro is meant to be the single currency of the European Union as a whole’, Jean-Claude Juncker emphasised in his speech to the European Parliament on 13 September this year. His ‘6th scenario’, referring to the five scenarios outlined in the Commission White Paper, includes the goal that, in accordance with the EU Treaty, all EU Member States – apart from those that are exempted from this requirement – should join the euro. For achieving this, he suggested a ‘euro-accession instrument’ to be added offering technical and even financial assistance. However, later it was clarified that no country should be forced to join the euro area. The Juncker statement addresses nine out of the 28 existing Member States that have not yet adopted the euro. Amongst these nine countries are six Eastern European countries: Bulgaria, Croatia, the Czech Republic, Hungary, Poland, and Romania. In addition, this list includes Denmark and the United Kingdom, which have an opt-out from this obligation. Sweden, without having an opt-out, voted against adopting the euro in a referendum in 2003. The convergence criteria to join the euro area are only partly satisfied. According to the Treaty of the European Union (TEU), ‘The Union shall establish an economic and monetary union whose currency is the euro’ (Article 3(4), TEU). The set of criteria to be able to join includes price stability, sound and sustainable public finances, long-term interest rate and exchange rate stability, and are supervised in a convergence report every second year according to the Treaty of the Functioning of the EU (TFEU, Article 140). The latest report was published in 2016. According to this assessment, no country satisfied all requirements at this stage. All EU-CEE countries satisfied the criteria of price stability, long-term interest rates and public finances (with the exception of Croatia). None of them achieved the goal of exchange rate stability. Croatia only succeeded in the compatibility of the national legislation. The most recent figures are presented in the following table; the next report is expected in spring 2018. None of the countries has yet entered the ERM II status. An additional criterion is that the countries have to be in the European Exchange Rate Mechanism (ERM) II for at least two years before finally adopting the euro. None of the countries has entered ERM II so far (with the exception of Denmark). Thus, even if the countries were to enter the ERM II in 2018, it would take at least until the beginning of 2020 for them to be able to join the euro area; this would be after the next EU elections in 2019. However, exchange rates have been fairly stable over the last three years; the Czech Republic, Hungary and Poland experienced devaluation of their currencies by about 1.5%. The accession criteria need to be enriched by a set of additional factors. One lesson learned from the crisis is that the set of criteria whether a country qualifies for joining the euro area is to be extended by additional indicators (Article 140(1) of the Treaty). These include, for example, integration of markets, balance-of-payment developments, unit labour costs developments and other price indices. Many of these additional variables are already screened in the European Semester. However, a thorough discussion is needed on which is the best framework to be adopted and which criteria are conducive to speeding up convergence and ensuring stability in the accession process and within the EMU – if the countries are willing to join. The announced ‘euro-accession instrument’ – offering technical and financial assistance – should aim at achieving convergence also in real terms. Close attention has to be paid to real economy developments and catching-up performance. 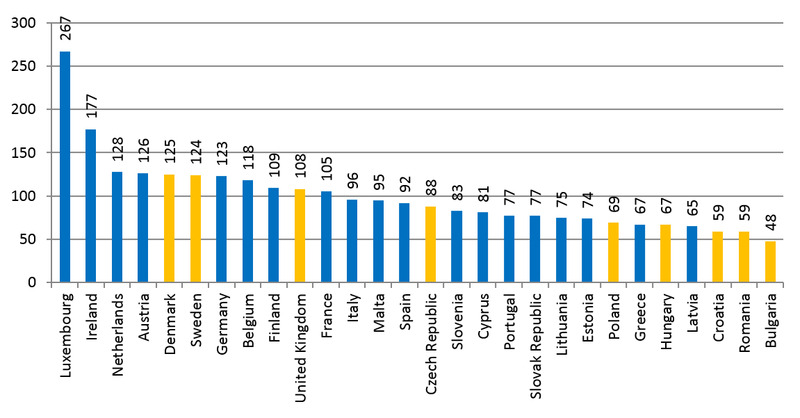 As an example, real GDP per capita as shown in the next figure differ widely across the EU-28. Latvia, with 65%, is the euro area country with the lowest GDP per capita. From the potential euro adopters only Croatia (59%), Romania (59%), and Bulgaria (48%) are below this level. Poland and Hungary, with 69% and 67% respectively, show levels similar to Greece, whereas the Czech Republic already reaches 88%. Note: Euro area members are shaded in blue; others in yellow. Source: Eurostat. Public opinions about the euro differ widely across the countries. Though according to Eurobarometer, a small majority in most countries believe that the introduction of the euro in other countries have had positive effects (exceptions to this are the Czech Republic and Croatia), the proportion of respondents who are in favour of introducing the euro in their country varies widely, from 64% in Romania to 29% in the Czech Republic. Question: Generally speaking, are you personally more in favour of or against the idea of introducing the euro in (OUR COUNTRY)? Further, in most countries only less than a quarter of the population think that their country is ready to introduce the euro, though 40% on average think that euro introduction will have positive consequences for their country or for them personally. On average, only less than 25% think that the euro will be introduced in the next five years; these shares are higher in Croatia (42%), Bulgaria (37%), and Romania (36%). The public assessments are also mirrored in the political will. The governments in Poland and Hungary (differing from the public opinion) are opposing the introduction of the euro; the situation in the Czech Republic is less clear, though it became more euro-sceptical over the last years. 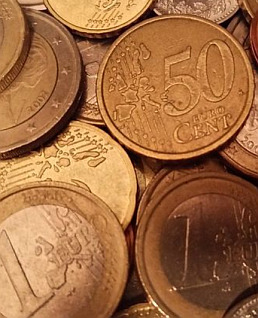 The governments in Bulgaria, Croatia, and Romania are in favour of introducing the euro rather early. 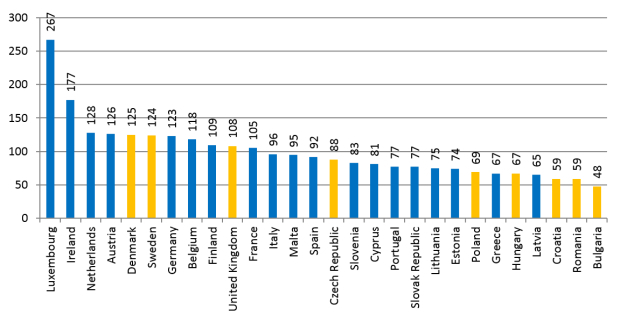 Thus, it seems that non-euro countries that are more advanced in real terms – Denmark and Sweden, and the Czech Republic, Hungary and Poland – are opposing the introduction of the euro, whereas those countries that are further behind – Bulgaria, Croatia, and Romania – are more in favour of joining the euro, which might be assisted by the announced ‘euro-accession instrument’ to achieve real convergence. An extension of the euro area can therefore be expected not earlier than 3-5 years from now. First, the formal requirement of being part of ERM II has not even started yet; second, countries still have to work to fulfil the criteria if they want to join. In the meantime and independently of this, cohesion and convergence in the EU-27 has to be enforced again. A potential euro-area enlargement needs also to be assessed via the background of EU initiatives such as completing the banking union and the capital union, which are intended to mitigate potential risks of financial instability.